"Well worth the five stars, loved every minute of this book, will definitely be reading the next editions, fantastic." "If you like zombies, you'll love this book. It was exciting, and kept me all the way through. But it wasn't just about zombies, there was a real story that had my interest. Can't wait for the 2nd book!" "As above this is another book of the series which didn't take a long time to read, purely because I couldn't put it down. The author will grab you from the very first page. I then found myself scouring Amazon for more." "The story is fast-paced, creative and keeps your attention. I can't wait for the next book!" "This is a different take on the zombie genre. I gave this book five stars as it was an exciting read. I look forward to reading book two and three of this series." Angora Laboratories, headquartered in Port Steward, is greatly invested in the cause. Creating a cure may be within the grasp of Angora, but which side they are on…only time will tell. While the deaths of hundreds of citizens are a tragedy, what’s worse, is that they don’t stay dead for long. Once the disease takes hold of its victims, it continues ravaging their bodies, reanimating their corpses. Time is running out, not only for Roxy and her family, but for all the residents of Port Steward. As military forces prepare to set up a city-wide quarantine, there may be little chance of surviving the plague. With time running out and cannibalistic beasts on her heels, will Roxy be reunited with her family or join the ranks of the undead? Visit the Rise of the Plague website for more information about Port Steward and the characters in Endemic Rise of the Plague. Follow Jeannie Rae's board Endemic Rise of the Plague on Pinterest. "A really thrilling book keeps you gripped from the first page! You never know what's going to happen on the next page, I would definitely recommend it." "This was another fantastic zombie story. Great characters, great plot, which held my attention ask the way through. Well worth reading, I will read more from this author." This free short story had been posted to my blog, under the same heading. The story began in mid-October 2012 and ran with one scene being posted daily until Halloween. It's a "side-quel" to the books in the Rise of the Plague Series. The Sickness: Monte’s Story is sixteen year-old girl’s first hand encounter of discovering the plague and her race to stay alive. It’s set in the same location as the novel (Endemic Rise of the Plague) but takes place across town, the morning after the outbreak. With this short story being written in the first person, through the eyes of Monte, readers will find that the full length novel is written with a different approach. This short story is designed to give readers a taste of what is happening in the coastal town of Port Steward, but Monte’s interaction with the characters in the novel is limited. You can download the entire story to your e-reading device FREE through Amazon or Smashwords. If you've read the book and want to leave a review, it would be greatly appreciated, whether you leave your review on Amazon, Smashwords Goodreads or send it directly to me, is all up to you. Follow Jeannie Rae's board The Sickness: Monte's Story on Pinterest. Zombie stories from thirty-two of your favorite female authors in the zombie genre. With over 325,000 words and featuring some of Amazon's Best Selling Female Authors of Horror, this is certainly not your typical anthology book. 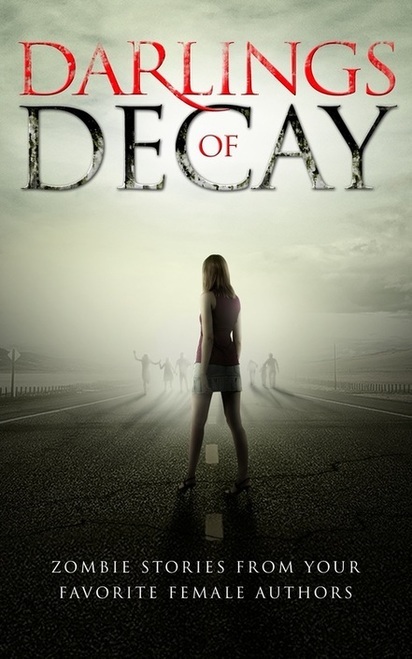 Darlings of Decay is available on Amazon for a fee, and is expected to be reduced to free status within a few weeks. It you want to score it free right now, head on over to Smashwords and get your copy of this eBook free. With over 900 pages of zombie fun, you're sure to be entertained by this free behemoth of an eBook.